These large concrete planters will add a touch of character and greenery to any downtown area, business complex or city landscape. Because of concrete's ability to last for extended periods of time, concrete planters have become a common decoration implemented all over the country. 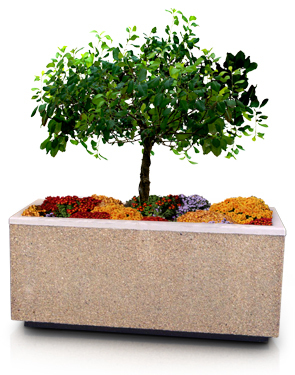 The size and strength of concrete planters are ideal for planting large shrubs, trees or high quantities of flowers that other planters may not be able to support. Concrete is strong enough to contain root systems of larger plants that may split less durable planters and also offers insulation protection to plant roots. All planters come standard with drain holes for proper drainage. Rectangular planters are available in multiple sizes to fit your specific needs. Available color options and finishes shown below. Maximum of 4-6% air entrainment.